"Sampath Speaking" - the thoughts of an Insurer from Thiruvallikkeni: Don't know Sachin ............get bombarded ... 'Who is Maria Sharapova ?" 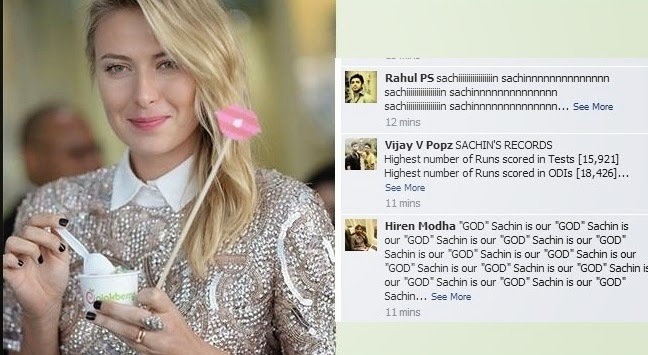 Don't know Sachin ............get bombarded ... 'Who is Maria Sharapova ?" In Nov. 2013, he walked back to that 22 yard – bowed down, touched the pitch and paid reverence showing the regard he has had for the game and the way he played it ~ most of us for sure know what is being referred to ….. Can you name the top goal scorers at this stage in FIFA 2014 – or do you know the Quarter finalists of Men’s in Wimbledon 2014 ? Two years after becoming Wimbledon’s junior champion, Eugenie Bouchard of Canada is one match away from taking the giant leap and capturing the grown-up top prize, the Ladies’ Singles crown. She beat Romania’s Simona Halep, the No.3 seed and runner-up at the French Open, 7-6(5), 6-2, in one hour 34 minutes. In the other, Petra Kvitova advanced to the Wimbledon final for the second time with a 7-6(6), 6-1 semi-final victory over countrywoman Lucie Safarova. The first all-Czech semi-final in Grand Slam history was a tightly contested battle in a 51-minute first set, despite Kvitova securing the first break of serve in the opening game. Two days ago, It took seven match points to do it but Angelique Kerber finally silenced Maria Sharapova, beating the Russian former champion 6-7 (4-7) 6-4 4-6. Maria Yuryevna Sharapova, the good looking Russian is ranked 5; has won 32 WTA singles titles, including five Grand Slam singles titles. The WTA has ranked Sharapova world No. 1 in singles on five separate occasions, for a total of 21 weeks. She became the world No. 1 for the first time She has been in nine Grand Slam finals with a record of 5–4 with her most recent grand slam coming at the 2014 French Open where she won her second French Open title and fifth grand slam title overall. By winning the 2012 French Open, she became the sixth woman in the Open Era to complete the career Grand Slam in singles. In the same year, she won an Olympic silver medal in the London 2012 Olympics. Hell hath no fury – and Maria Sharapova, is in news – being scorned and teased in social media as fans reacted with outrage - and a dose of humour – resulting in #whoismariasharapova trending worldwide. The top Twitter trend in India, perhaps of now is 'Who is Maria Sharapova?' – not that Indians have no knowledge of Tennis or have forgotten the recent Roland garros – but something else. As English Press reports, one picture posted by Sharapova recently has 16,000 comments in the afternoon, - a majority are by ….. fans questioning Sharapova's impudence, and by evening it had crossed 24,000 comments. The self proclaimed fans have taken the pain to go to almost every picture on Sharapova's album, even pictures she posted many months ago and spammed with comments ………….. all because ….. she doesn't know who Sachin Tendulkar is. On that day in Nov. 2013, it was a script, made, rehearsed and fine-tuned.. not the speech but the final game and retirement of the Great Sachin Tendulkar. It all started there at Wankhede in 1988 with a century in debut in Ranji and the 24 years of International Career with unmatchable excellence ended at the very same place with every one who had played in his debut match having retired decade ago. Outside Cricketing arena, in 2012 Tendulkar was nominated to the Rajya Sabha, the upper house of the Parliament of India. He is the first sportsperson and the first person without an aviation background to be awarded the honorary rank of Group captain by the Indian Air Force. In 2012, he was named an Honorary Member of the Order of Australia. After a few hours of his final match on 16 November 2013, the Prime Minister's Office announced the decision to award him the Bharat Ratna, India's highest civilian award. He is the youngest recipient to date and the first ever sportsperson to receive the award. When asked about the occupants of the Royal Box in the post-match conference, the French Open champion said she was familiar with David Beckham. "I've actually met him a couple times at events in LA and in London. He is a great guy. Besides being an incredible football player, he has done so much in his career, having a family, maintaining so many things off the court. He is a really nice person to chat to. We're not best friends or anything, but it's nice to be able to say hello and congratulate each other on achievements we've had in our careers and so on." However, when asked about Sachin Tendulkar, the Russian tennis player drew a blank. She reportedly answered back to the Q - Do you know who Sachin is -: "I don't." 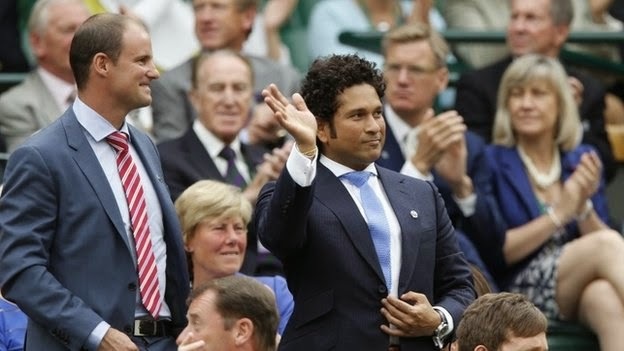 Tendulkar, who is on good terms with Swiss tennis player and world number 4 Roger Federer, was on the gallery alongside Andrew Strauss and Beckham………… his fame hasn't clearly reached the tennis beauty. However, the result of a poll conducted by BBC Sport showed Sachin as the biggest sportsperson in the Royal Box that day. A writer in the newsminute.com writes it is no sin….. in the Royal Box at Wimbledon, there were several other sports personalities along with Sachin, including Sir Bobby Charlton, David Beckham, Bradley Wiggins, Chris Robshaw, etc., to name a few… well, many we do not know.